This shot is current, taken on Friday. This artist in Germany makes the most interesting sulptures. This shot has quite a bit in common with Frank's [ of Frank Nellie fame] pic today, Mary. Mary MacADNski: Yes, reflections in common. Quite beautiful in B&W Mary! Well done. Mary MacADNski: I like it too. Thanks. Bien fait mais j'aurais aimé voir ces reflets en couleurs. Will we get a chance to see this in colour, too, Mary? Mary MacADNski: I will show it next week, Lisl, with others from the beaver pond across the road. Delightful abstract, Mary. And those sculptures...O M G.
Mary MacADNski: Thanks, Ginnie, Chad and chris have seen and photographed one on their trip. I love this B&W and reflections are so wonderful. And those sculptures are amazing. They need a nice and big pond to show off. Mary MacADNski: I would volunteer my pond! I will show this shot in colour next week. Mary MacADNski: A mind that sees things very clearly. A fine Black Monday image Mary. That artist sounds Polish by name, and I think I photographed one in Germany with Tiff. He might post it soon, or if not I will later. Mary MacADNski: She is Polish. The link gives her bio and other work which is interesting too. Mary MacADNski: I love novel art. I will show some other shots from the beaver pond next week. a jungle of reflections! I don't know this Polish artist. Mary MacADNski: Oh, please check out the link. Chris and Chad took photos of one of her sculptures in Germany. You have gone b&w again?! This picture has a lot going for it. Mary MacADNski: Mondays are B/W themed, Black Mondag. Black and white does it true justice, Mary. Mary MacADNski: I think so too but will show the colour version next week. i like the stretchy feeling in the vertical direction owing to the trunk and the branches. some very nice sculptures, Mary. Mary MacADNski: You might like next week's series. 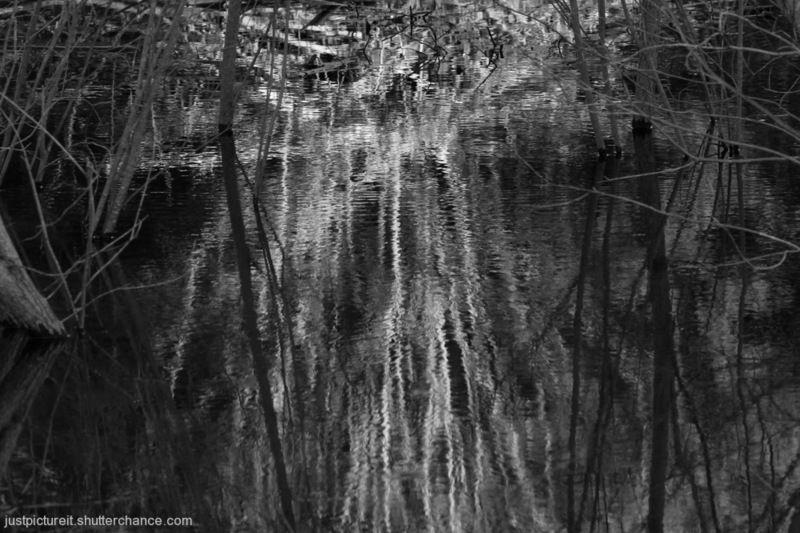 It makes a fine abstract in B&W. I guess it would have a different feel in colour. I was impressed with the fountains following your link. Mary MacADNski: I am showing the colour version next week. You might well run across one of these sculptures in your travels. A lovely atmospheric shot Mary. Those sculptures look interesting, thank you for the link. Mary MacADNski: Similar shots next week. Interesting sculptures for sure. Trouble with coming on here later in the day, somebody, in this case Ray, manages to pinch ones comment! Mary MacADNski: That early bird often gets the worm. The day changes on the blog as I am going to bed and as he is getting up.